Leadership Greater Rochester, a non-profit organization, whose mission is to develop leaders through participation in community awareness activities designed to encourage participation in an active leadership role in the greater Rochester area., recently completed its first program year. 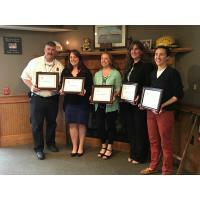 Sonja Gonzalez, City of Rochester; Lauren Jerr, Granite State College; Stacia Jablonski, Homemakers Health Services; Chief Mark Klose, Rochester Fire Department; Angela Mills, Rochester Main Street; and Tatjana Simon, Holy Rosary Credit Union. The fee to participate in the Leadership Greater Rochester program is $500. The cost can be paid by the participant or their employer. Applications can be obtained on the Leadership Greater Rochester webpage or by calling the Greater Rochester Chamber of Commerce at 603-332-5080. The deadline to apply for the 2018-2019 class is July 15, 2018. Leadership Greater Rochester is a 501(c)3 non-profit organization.